This weekend, a friend of mine spent a few tens of thousands of dollars buying a piece of American history at the Potomack Auction House in Alexandria, Virginia. He had been tipped off by Emily Heil’s recent Washington Post article that a letter written by then President Thomas Jefferson to another founding father, John Dickinson, was for sale. Read the entire letter below. It’s a document that I wish leaders today could write, or perhaps tweet in shorter form. The last such exchange I can think of was the private letter that outgoing President George H.W. Bush left for the incoming Bill Clinton. Donald Trump and the country would gain much, I think, from reading the letter and practicing the message. 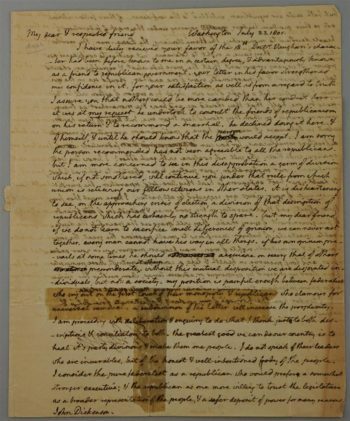 Sometimes it is difficult to explain to foreigners abroad what the essence of Americanness is — and to me, that sense of civitas which flows in this Jefferson note to Dickinson, and that in GHW Bush’s note is a lot of what has traditionally defined that unusual ingredient defining the country and its best leaders. I have duly recieved your favor of the 18th. Doctr. Vaughan’s character had been before known to me in a certain degree, & advantageously known as a friend to republican government. your letter in his favor strengthened my confidence in it. for your satisfaction as well as from a regard to truth I assure you that nothing could be more candid than his conduct here. it was at my request he undertook to consult the friends of republicanism on his return & to recommend a marshal. he declined doing it here & of himself, & until he should know that the person would accept. I am sorry the person recommended has not been agreeable to all the republicans. but I am more concerned to see in this disapprobation a germ of division which, if not smothered, will continue you under that rule from which union is relieving our fellow citizens in other states. it is disheartening to see, on the approaching crisis of election, a division of that description of republicans, which has certainly no strength to spare. but, my dear friend, if we do not learn to sacrifice small differences of opinion, we can never act together. every man cannot have his way in all things. if his own opinion prevails at some times, he should acquiesce on seeing that of others preponderate at others. without this mutual disposition we are disjointed individuals, but not a society. my position is painful enough between federalists who cry out on the first touch of their monopoly, & republicans who clamour for universal removal. a subdivision of the latter will increase the perplexity. I am proceeding with deliberation & enquiry to do what I think just to both descriptions & conciliatory to both. the greatest good we can do our country is to heal it’s party divisions & make them one people. I do not speak of their leaders who are incurables, but of the honest & well-intentioned body of the people. I consider the pure federalist as a republican who would prefer a somewhat stronger executive; & the republican as one more willing to trust the legislature as a broader representation of the people, & a safer deposit of power for many reasons. but both sects are republican, entitled to the confidence of their fellow citizens. not so their quondam leaders, covering under the mask of federalism, hearts devoted to monarchy. the Hamiltonians, the Essex-men, the revolutionary tories &c. they have a right to tolerance, but neither to confidence nor power. 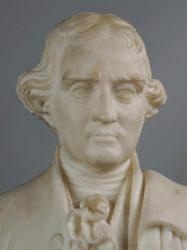 it is very important that the pure federalist & republican should take this honest & dispassionate view of one another, should see in the opinion of each other but a shade of his own, which by a union of action will be lessened by one half: that they should see and know the monarchist as their common enemy, on whom they should keep their eye, but keep off their hands. but in Delaware it seems we have a preliminary operation, to reconcile dissenting republicans: for how can federalists coalesce with those who will not coalesce with each other? I know too well, my friend, your moderation, your justice, your affection to national liberty, to doubt your best endeavors to heal this two-fold separation. the purity & perspicuity of your views are respected by all parties. I hope much then from their effect, and that operating on the good sense & patriotism of the friends of free government of every shade, they will spare us the painful the deplorable spectacle of brethren sacrificing to small passions the great, the immortal & immutable rights of men. may heaven prosper you in your endeavors, and long preserve in health & life a consistent patriot, whose principles have stood unchanged by prosperous or adverse times, whom neither the civium ardor prava jubentium, Nec vultus instantis tyranni mente quatit solida? I tender you the homage of my constant & affectionate friendship & respect. For the time being, my friend is remaining anonymous as he doesn’t want the focus of this acquisition to be about him — but rather to be about the letter and its highly relevant message. I do know though that he will explore ways of using this document of political realism and magnanimity to inspire a contemporary dialogue about our national health.